Anderson’s is Hosting ‘Shake it up for Breast Cancer’ & It’s a Win-Win for Everyone! As I’m sure just about everyone knows by now, October is breast cancer awareness month. It is a way to shine light on a disease that 1 in 8 U.S. women will develop in their lifetime. Odds are – you know someone who has had or is fighting breast cancer. Someone you love, someone in your family – a friend – a co-worker. For one local restaurant chain, spreading the word and helping to find a cure – is personal. At Anderson’s Custard, the disease has impacted two ladies close to their hearts. They make it their mission to do what they can to make a difference. With those ladies and all of those who have fought or who are currently fighting breast cancer in mind, the Western New York based chain is hosting its “Shake It Up For Breast Cancer”. 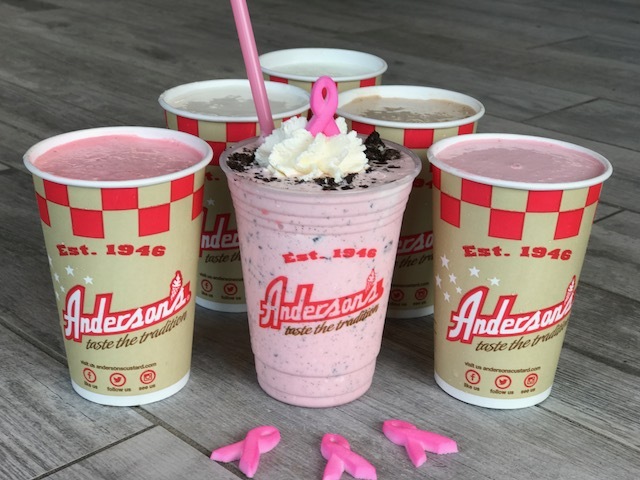 With every purchase of any regular or large-sized milkshake through October 16th, Anderson’s will be donating $1 to a couple of great causes – For Our Daughters and Hope Chest. For Our Daughters’ is a wonderful organization, started by Mercedes Wilson – a breast cancer survivor. Their mission is to make sure that all young women are informed about their health and their family history. For Our Daughters visits middle and high schools in Western New York to show young women how to open up dialogue with the loved ones in their lives. Hope Chest is an organization that not only provides a positive support group for breast cancer survivors, but also gets those survivors moving! They offer a unique paddling program and a health and fitness program for breast cancer survivors of all ages and fitness levels. The goal is to inspire breast cancer patients and survivors, regardless of where they are in their treatment or recovery, to lead active and fulfilling lives through physical fitness! The “Shake It Up For Breast Cancer” event continues at all 7 Anderson’s locations through October 16th!